Young actor Mahat Ragavendra was first noticed in Venkat Prabhu’s Mankatha in which he played the role of a bar owner who was involved in the money racket along with Premji and Ashwin. Later in the beginning of this year he played the role of Vijay’s younger brother in Jilla. 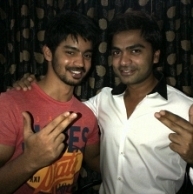 Now Mahat’s next film is interestingly titled Simbu in which the Vallavan hero is said to be making a cameo. When Simbu was asked about this, he jocularly states, "Although I had initial reservations on this, I let them use my name as title". Simbu is being made in Telugu also with a more interesting title Puri Jagannath. Telugu audience would be quite aware that Puri Jagannath is a noted film director, producer who has made films like Pokkiri, Chirutha to name a few. People looking for online information on Mahat Raghavendra, Puri Jagannadh, Simbu will find this news story useful.